← Is that a fact? I stepped into my kitchen last night and gazed over the several piles on my table. Construction plans, a bucket of garden veggies that needed tending, bills, a small heap of towels to fold, notes with reminders for pet care, shopping, and recipes, all told the story of the day I had had. It’s surface area is roughly 5 X 3 feet. Yet it has an other-worldly quality in it’s ability to expand with need. It’s where we eat, pay the bills, mull over big ideas, and solve problems. It’s where we hold meetings, argue, and come together for thanks. It’s a building and an art surface. It’s a writing desk and a chopping block. It’s a place to lean on. It never falters. It’s a heart that keeps on beating. It’s my kitchen table. While I don’t believe in multi-tasking for myself, I do keep a daily list on my computer to dump ideas-a sort of virtual kitchen table. Here I keep track of chores, reminders for appointments, and prideful notes of things I can eventually cross off like finish a novel, lose those extra pounds, and notes on acceptance speeches for an Oscar, Tony, and Citizenship awards. Having a place I can count on, a place on which I can lean, both in my kitchen and in my mind steadies me as I go forward. Now if I could just accept that Oscar sitting at my table surrounded by the familiar, I might not have to worry about the gown I would have to purchase. What’s on your kitchen (literal or metaphorical) table? This entry was posted in general and tagged Academy Award, creative writing, humor, inspiration, Kitchen, kitchen table, mtetaphore, Oscar. Bookmark the permalink. Beautiful post Sally! I think you’re right, kitchen tables deserve more credit. I know ours is always overloaded with stuff. Right now it has a set of dishes to be put away, my ipod sound dock, two newspapers (for recycling in the bunneh boxes), two fantasy football magazines, three pairs of glasses, two boxes of tea and an empty napkin holder. We haven’t eaten at that table in weeks, but it’s still used daily! We should take pics periodically of our tables. The ipod dock will be so yesterday in a few years! Glad to see your list rivals mine! Thanks for checking in, Stace. One of your best. Hope my friend Ellen White reads this one. Thanks for your overwhelming support MJ! I think your table is an ebay zone, Lis. Thanks for checking in! well put and it is so true. I like to keep mine cleared off but that doesnt mean it happens. Now at the lofts we have the dinningroom table set up with 2 leaves probably 7+ feet, so you can imagine what kind of an invitation for stuff that is! 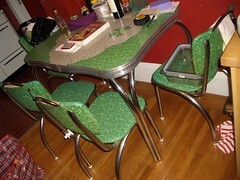 I totally love the retro table and chairs you used in your post. 7 feet! sounds like a locale for a feast of epic proportions. Thanks for reading my blog. I just got back from an all inclusive trip to Cancun Mexico. While there, for the first time in my life, I couldn’t make my mind recall what was on my kitchen (literal or metaphorical) table. I have to tell you it was the most liberating feeling – a true and total stress buster. I think I will have to make it an annual event!! Sounds healthy! Glad you are stateside and tableside. I don’t even HAVE a kitchen table anymore! But this 6′ white one where my computer, printer, notebooks, letters to be answered, bills to pay, dog collar, colored pencils, reminders and photos taped up on wall before me, this one IS in the kitchen in a “nook” I call my “office” Ha! And I even have a window to my world on my right where I can snoop on the neighbors, watch the sunflowers bloom, see the bird feeder – which I must fill soon as this morning it was 30 degrees out even as I sit and type. My big dog’s 4th bed is behind me on the floor so he can keep me company when he wants do. My little dog is now snoozing on her favorite couch in the other “office” room which used to be a sunporch. Because I live alone I can eat on a tray and watch LEVERAGE, my favorite show. Living alone has many benefits…How cold is it in Maine???? Good one, Sal. I have a galley kitchen; no table. But, what would be kept there is on my counter tops: eye glasses, phone book, note pads, pens, old mail, new mail, catalogs and anything else I have to put down when I come in the door. Where do I eat? Usully I’m standing in front of the sink. Speaking of food; mama turkey and five youngsters are pecking around my backyard. They have been there all morning. I wonder what they’ve found that is so tasty. Games, lots of games, the favorites that never seem to get put back on their shelf.